We propose a moment for you. Close your eyes and let yourself creep into a calm and gentle ocean. Feel how your head slows down, your mind relaxes, the jaw expands and your feet shake pleasure in a dance of pressure and stretching. Enjoy this Foot and Craniofacial Massage. In this massage we show you some of the most exquisite details you will find in our most elaborate rituals. We have prepared a little bit of pleasure and disconnection for you. A selection of manual techniques, gemmotherapy and chromotherapy chosen especially to make these 35 minutes the best regenerative and harmonizing trip you’ve ever tried. Discover the benefits in your skin, mind and color. 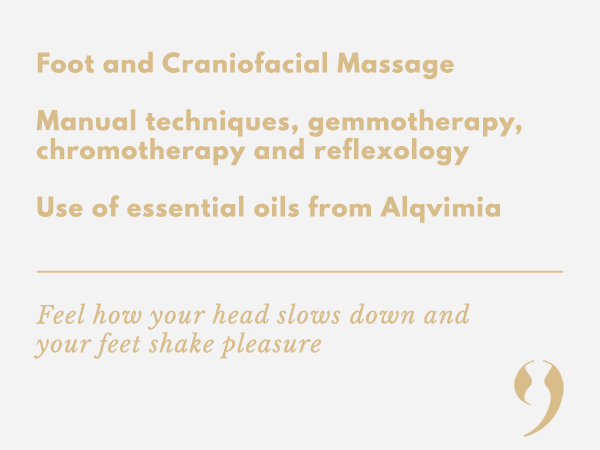 Enjoy a deep facial skull massage, being the effect of jade and amethyst, the pleasure and the healing reach of reflexology at your feet. A combination of techniques of different types of therapy and massage will accompany you at this time of rejuvenation. Enjoy this Foot and Craniofacial Massage.